After spending a more relaxing long weekend in Sedona, Arizona, I was ready to hit the road again in my more typical fashion. I've spent a lot of time in different parts of Arizona over the years though its mostly been in places everyone knows about- the Grand Canyon, Phoenix, Flagstaff ect. Part of Arizona which has more recently intrigued me was the "Sky Island Country" of the southeastern portion of the state. Well known to locals though off the grid for tourists, it holds a special place in the hearts of mountain climbers and adventurers. "Sky Islands" are perhaps the most fitting term for this highly distinctive environment. The floor of the Sonoran Desert is variable- ranging from 2,000-3,000 ft near Tuscon and between 4,000-5,000ft near Sierra Vista and Douglas. Compare this to the summits of most of the mountain ranges which are 9,000-10,000ft. At the bottom, temperatures routinely sore into the 100's and 110s in the summer while the mountains maintain a pleasant 60-70s. Life adapts appropriately and it creates a Galapagos-like in biodiversity. In this case, its not an ocean that separates the "islands" but rather a hot desert. Normally I don't care too much for highways up mountains as it detracts from the adventure of hiking to a summit. I make an exception for the Mt Lemmon scenic highway. 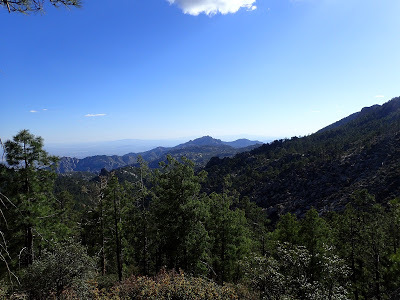 Starting in the outskirts of Tuscon, the highway traverses to the tip top of Mt Lemmon in about 28 miles. I did actually download the Mt Lemmon Science Tour App which really complimented the already great drive. It syncs precisely with the drive and highlights the geological and human history of Tuscon and Mt. Lemmon. 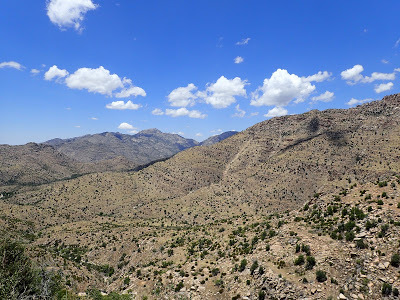 I didn't realize that by driving to the higher elevations of Mt Lemmon or any of the sky islands, its the equivalent of traveling nearly 1,000 miles in latitude based on the environments you encounter along the way. 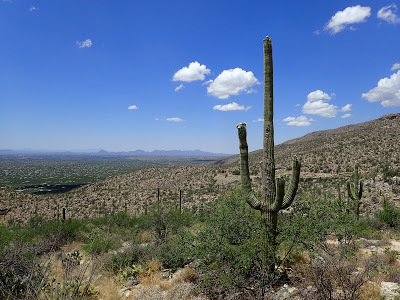 I loved how the stately Saguaros of the desert gave way to lush evergreen forests. Rocky hoodoos also rose at the higher elevations. What was supposed to be a straightforward drive took me at least two and a half hours with my constant stops and side hikes. Even at that pace, I felt rushed! 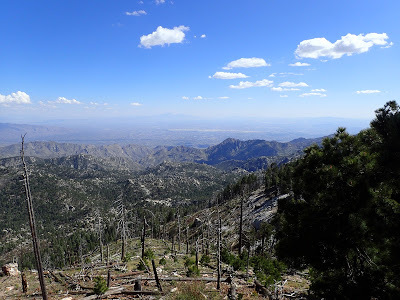 Though the highway is a destination in itself, I was here to hike Mt Lemmon. There's perhaps a dozen ways to make it to the summit on foot though none are straightforward. I don't know of any direct route to the summit. Some trails actually have the summit as a trailhead and head down from there. I preferred to put at least some effort in to hiking the summit so I chose Marshall Gluch as my trailhead. This is at an elevation of about 7,440'. Note that this parking is scarce here and the trailhead is popular- get there early! 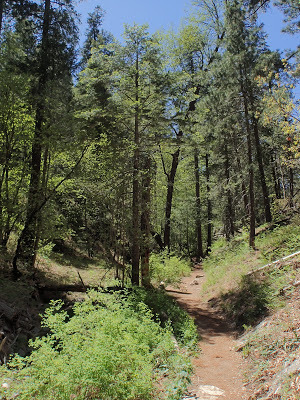 The trail stays in a protected and shady canyon for the first mile and a quarter. There's a smell of pine trees in the sun that I always associate with tranquility and memories of my first hikes in the Sierra Nevada. That first mile of the hike was powerfully nostalgic. Months of drab midwestern winter blues melted away. Emerging from the canyon at Marshall Saddle, the views start to open up. Past forest fires have laid some patchs almost completely bare. Unfortunately the forest fires are the product of strict fire management in the past before we realized that low-level forest fires are a natural part of the Arizona environment. Nevertheless, the views really open up in these sections with the entire Tuscon Valley and the Rincon Mountains in plain sight. I kept my camera out constantly for pictures. The trail did steepen quite a bit as it meandered towards the summit. Switchback abounded though the continuous stream of panoramas eclipsed the hard work of climbing. My favorite section would have been about the 8.500' section were development was minimal. As the trail winds up to the summit, the ski resort and observatory make the final push underwhelming. But there was still a sense of accomplishment that came with finally bagging my first summit in months. Had I more time, I would have liked to have hiked the Meadow Trail Loop which is easily done in 45 minutes to an hour and probably a better summit experience . 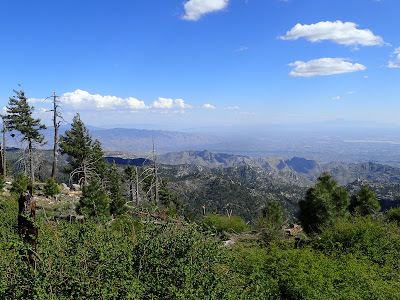 You can hike Mt Lemmon in an all day blitz from the valley floor or make it a drive. I suppose this hike is the best of both worlds- I was able to enjoy the scenic byway but also have some wilderness and solitude in my trip to the summit. Any map of Mt Lemmon will show you that this is one of perhaps several dozen ways to get to the summit and I'd like to hike an all day trek next time. But I had more Sky Islands to see and I was off to a great start!